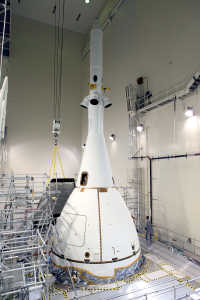 A crane brings the fourth and final Ogive panel closer for installation on Orion’s Launch Abort System inside the Launch Abort System Facility at NASA’s Kennedy Space Center in Florida. On Dec. 4, Orion is scheduled to launch atop a United Launch Alliance Delta IV Heavy rocket from Cape Canaveral Air Force Station’s Space Launch Complex 37 in Florida. During the test, Orion will travel 3,600 miles in altitude above Earth. Some 4 1/2 hours later, the spacecraft will reenter the atmosphere at 20,000 mph and splash down in the Pacific Ocean. Orion’s first flight will verify launch and high-speed reentry systems such as avionics, attitude control, parachutes and the heat shield. Four recently-installed protective panels make up Orion’s Ogive. The Ogive reduces drag and acoustic loud on the crew module, making it a smoother ride for the spacecraft. The Ogive installation was one of the last pieces of the puzzle for Orion prior to its move the launch pad on Nov. 10. There, it will be lifted and attached to the rocket for its December launch.